I needed a quick bite before bridge, so I decided to stop in for a bite at Pizza Pie-er, a shop tucked back from the street, next to the Hess station. The space is bright and comfortable, including very clean bathrooms. They don’t serve slices, so I opted for a personal sized (7”) pizza Francesca ($6.74). It was advertised to have sliced mushrooms, prosciutto, tomato sauce and cheese, but apparently the people at Pizza Pie-er do not know the difference between real prosciutto and ham. 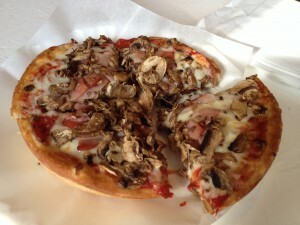 I appreciated that the mushrooms were fresh, but the crust was too thick and clunky, while the sauce was too tart. I felt like I was at pizza hut. I think the draw here is that they offer 4 different crusts, including gluten free and whole wheat, but if you don’t have dietary restrictions, go elsewhere.